International Windows Group Sp z o.o. was created as a family business by two brothers. It has produced sash windows, casement windows and wooden doors for many years. We sell box sash windows, Scandinavian windows, outward opening windows, casement windows; round, oval shaped windows and in any shape that is requested by the customer; garden doors, French doors, external doors, front doors and all types of European windows. The newest technologies that we regularly introduce to our firm for the last few year, allow us to give you a guarantee of high quality of services. English wooden windows that are in our offer, are made of the highest quality materials, based on innovative technologies available on the market and with the use of machines and tools of recognized producers. 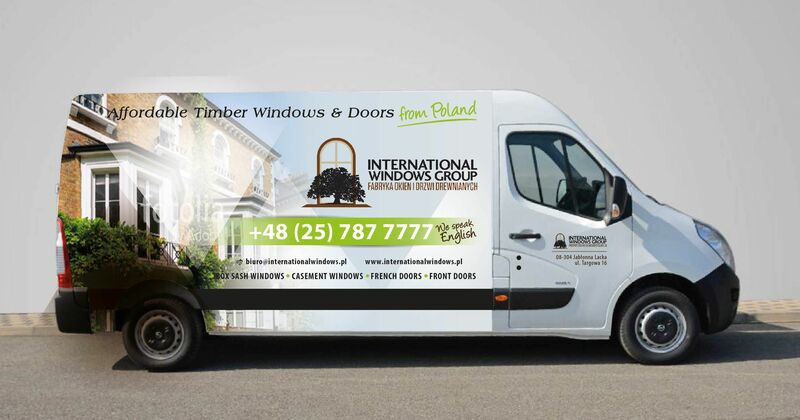 Thanks to the experience of our employees who have been operating in International Windows for many years, we can present clients with hardwood windows (meranti or oak) and soft wood windows (pine) of the best quality. By investing in the machine park and modernizing it, we can guarantee you a wide range of services and introduce new products to the offer, such as timber sash windows and timber casement windows. In addition, thanks to many years of work and knowledge we can take care of even the most demanding customers. Our PASSION is the production and creation of new technologies and innovative solutions, and our English traditional sash windows and traditional casement windows are Masterpieces of Woodwork. Our company also specializes in the reconstruction of antique woodwork. This is enabled by the acquired qualifications and management to perform and supervise windows in the historic buildings of the City of London, entered in the register of monuments. Thanks to the experience gained, we have introduced windows that are a faithful replica of box sash windows and windows casement found in historic tenement houses. This is certainly an excellent solution for people who value tradition and classics. Timber windows are characterized by originality, elegance and their uniqueness. We strive to offer our clients affordable prices and flexibility in their negotiations. In addition, by producing tight wooden windows, sash windows and casement windows, we increase the comfort of our customers. The windows we offer are characterized by exceptional comfort of use. International Windows Group Sp. z o.o. since 2018 is also a producer of aluminium joinery. We offer a wide range of aluminium window systems and door systems. For the production of windows and doors we use the highest quality aluminium materials. You can choose between different profile thicknesses, shape or opening method. It does not matter if they are to be external or internal, sliding or opened classically. We produce aluminium windows casement windows and aluminium Bi-folding Doors and aluminium Sliding Doors. We will take every project. Aluminium windows are primarily characterized by low weight and very high durability. Aluminium is a material extremely susceptible to forming, so it is possible to create windows in curves or atypical shapes. Thanks to high strength and stability, it is possible to create unmanageable windows with a full view. The care of aluminium windows is extremely simple. Just wipe them once every few months with water and a cleaning agent that does not contain vinegar or other acid. Aluminium windows are most often found in modern buildings, where they blend in perfectly with the simple architecture and uniform colors of the façade. Aluminium joinery also has many usable advantages, which will be appreciated especially by people for whom the priority is a large area of ​​glazing in rooms. We produce our aluminium windows on the best profiles of renowned companies such as Aliplast and Aluprof. QUALITY, TIME, COMFORT, SECURITY AND SATISFACTION OF THE CUSTOMER. We invite you to familiarize yourself with our offer and encourage you to use the services of our company. International Windows Group sp z o.o. We have our own logistics fleet, thanks to which we deliver windows to various corners of Great Britain. We guarantee constant deliveries to London, where we have our business partner. Transport to London in the M25 zone is included in the price of windows. If the customer is outside the M25 zone, please contact us to arrange details. In addition to short delivery times, delivery time is also an important element for our customers. Therefore, we make every effort to ensure that the time of delivery of our wooden windows and doors is as short as possible and takes place within the time specified with the client. We are very flexible and we are able to adapt to the needs and requirements of the client. Thanks to our transport service, customer saves time and can calmly take care of his / her matters.